Follow Me (2005) | ManoaDNA.com | Order Your Copy of Live Aloha! 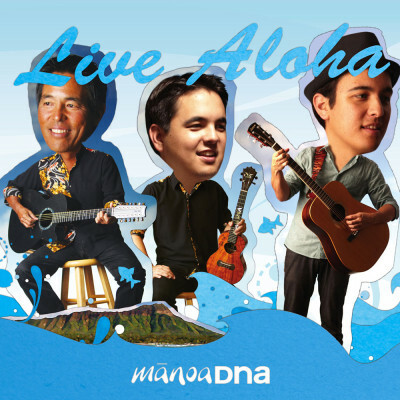 The debut album for Manoa DNA, “Follow Me” introduces listeners to the acoustic harmonies that the band is known for. Featuring mostly original compositions, the album also highlights the band’s versatility with folk covers, traditional Hawaiian songs and a song originally performed by local music legends Cecilio & Kapono. Cover songs like “Wasted on the Way” (Crosby, Stills, and Nash) and Home (Cecilio & Kapono) give listeners a familiar tune, while nine other original songs establish the group’s own sound and introduce Alex’s writing style. Pay special attention to the original track “If I Ever,” which made it up to number one on major Japanese radio. Also take a special listen to the groups cover of James Kauka’s “Haleakala,” a unique spin that creates a special energy with every playback.